Bacopa monniera (L.) Wettst is a renowned plant in the Ayurvedic system of medicine. The present study seeks to identify the anti-inflammatory activity of two fractions from the methanolic extract of Bacopa, viz. the triterpenoid and bacoside-enriched fractions. The ability of these two fractions to inhibit the production of pro-inflammatory cytokines such as tumor necrosis factor-α (TNF-α) and interleukin-6 was tested using lipopolysaccharide (LPS)-activated peripheral blood mononuclear cells and peritoneal exudate cells in vitro. We found that triterpenoid and bacoside-enriched fractions significantly inhibited LPS-activated TNF-α, IL-6 and nitrite production in mononuclear cells. Significant antioxidant activity was exhibited by the bacoside enriched fraction compared to the triterpenoid fraction. Carrageenan-induced hind paw oedema assay revealed that triterpenoid and bacoside-enriched fractions exerted anti-oedematogenic effect, while in the arthritis model only the triterpenoid fraction exerted an anti-arthritic potential. 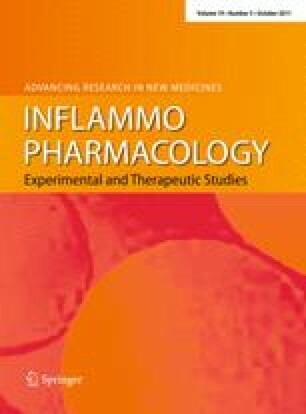 The present study provides an insight into the ability of Bacopa monniera to inhibit inflammation through modulation of pro-inflammatory mediator release. This work was supported by the Kerala State Council for Science, Technology and Environment, Sasthra Bhavan, Thiruvananthapuram, Kerala, India. Standardized Bacopa extract was obtained as a gift from Natural Products Pvt Ltd., Bangalore, India. The authors declare that there were no conflicts of interest.